Tuesday night: Clear and cold. Lows in the teens. Wednesday: Gradually increasing clouds, night snow to mix. Highs around 30. A chilly night as a center of high pressure centers itself over New England. Clear skies and the relaxing wind will allow for radiational cooling. That combined with our snowpack and we will have lows in the teens to single digits. 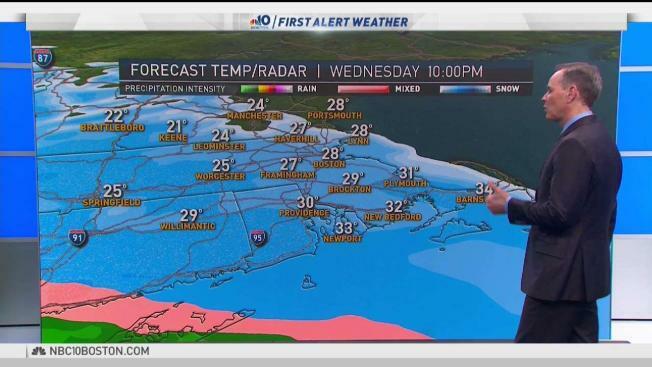 Northern New England once again dips below zero. Highs will be around 30 with increasing clouds Wednesday afternoon as our next wintry mess approaches. We have issued a First Alert for most of New England (excluding the far southeast and coastlines) for Wednesday night into Thursday morning. 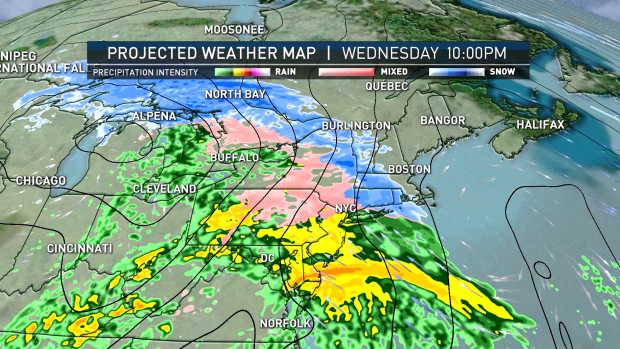 Enough cold air will stay in place for us to see light snow Wednesday evening, moving into Boston between 8 and 10 p.m. However, Gulf of Mexico moisture and warmth will bring in the warmer air aloft, changing the snow to sleet, freezing rain, then all rain by Thursday morning. Temperatures rise to near 50 in Rhode Island, Connecticut, and Massachusetts in the afternoon. Higher elevations in southern New England and northern New England will continue to see a wintry mix and snow through Thursday morning. Snow totals south will be 1-3 inches, while North Country will get 3-6 inches and over 6 inches in the mountains. Wind gusts will be around 30-40 mph Thursday morning, from the south. So the south coast and Cape Cod will experience the most wind. We are in a series of "King Tides" this week due to the Supermoon (officially full just before 11 a.m. Tuesday). Highest tides of the year this week means that we approach 12 feet in Boston, even without a storm surge. The storm on Wednesday night and Thursday could give us a surge of 0.5 to 1 foot on top of the high tide. Plan on minor pockets of flooding in the typical areas. Quiet weather on Friday as temperatures will be in the low 40s with sunshine. A second system in the 10-day outlook could give us a brief snow chance Saturday night, flipping to mostly rain Sunday. High temperatures will go from the low 40s Saturday to near 50 again Sunday. The pattern rolls on, with a break Monday and another disturbance Tuesday into Wednesday. This will be a potentially wintry mix type storm. The timing and track of this one is still uncertain. Stay tuned!